Canonical isn’t just the company behind the popular Linux distribution Ubuntu, but with Ubuntu One, it also offers a cloud storage service with 5GB of free storage space, as well as a music locker, and support for Android, iOS, Windows and, starting today, OS X. The Mac version is officially in beta, but already includes all of the standard Ubuntu One features, though users of other cloud storage services will likely miss things like drag and drop uploading and full integration into the Finder. 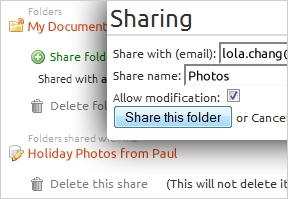 Similar to Dropbox, Ubuntu One’s referral program lets you bump up your free storage to up to 20GB. Additional storage costs $2.99 per month for every 20GB. The music streaming service, which includes 20GB of storage for your songs and allows you to stream your music via the web and to your Android or iOS device, costs an additional $3.99 per month. Ubuntu One, of course, has its fair share of rivals on the Mac, including heavyweights like Dropbox, Google Drive and Microsoft SkyDrive. For most Mac users, there is little reason to switch to Ubuntu One, but if you are an avid Linux user who also has a Mac at home or at work, Ubuntu One is probably worth a look. The Mac client is available for download here.